Last week I was at an amazing gathering at the ISS in The Hague, which brought together nearly 300 activists and academics to discuss the origins and implications of authoritarian populism. A short reflection on some of the themes emerging was published this weekend in openDemocracy. Whether in the form of Duterte or Trump, Maduro or Mugabe, Modi or Erdogan, the rise (and sometimes fall) of authoritarian regimes with populist, sometimes religiously inflected, often militarily enforced, is evident all over the world. In the build up to the event, we published a series of articles on openDemocracy with cases from India, the US, Myanmar, Brazil, Indonesia, Colombia and South Africa. The parallels are striking, although the contexts and political implications are very different. Do take a look. More from Russia, Guatemala and Colombia are coming soon! The focus of the Emancipatory Rural Politics Initiative is the rural and agrarian dimension. 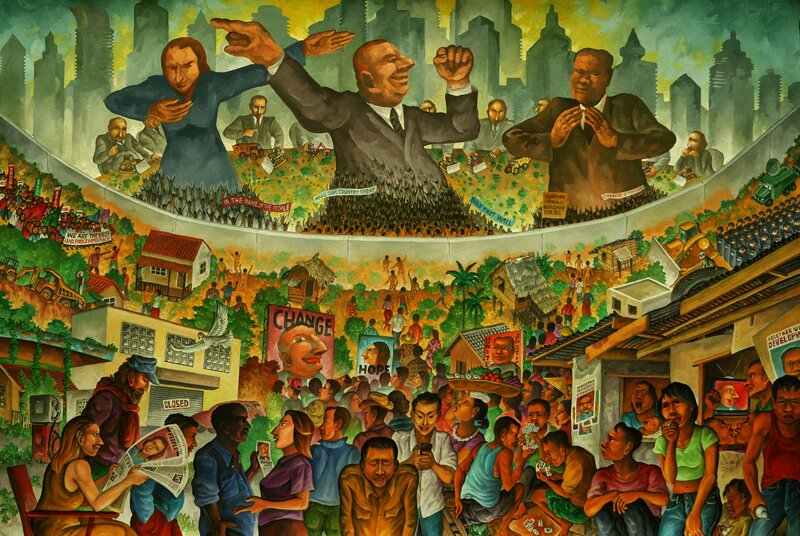 Much debate has focused on urban metropolitan areas, yet the support for many authoritarian populist leaders is rural, and the consequences of neoliberal neglect, extractivism and resource grabbing is keenly felt. Among the 80 odd papers prepared for the event (all available via the Transnational Institute, one of the co-hosts), there were quite a few papers from Africa, including several from Zimbabwe. How does Zimbabwe fit within this wider picture? Not obviously is the short answer. Mugabe’s economic populism was well known, with land reform the centre-piece, and anti-democratic, often militarised authoritarianism has always been central to ZANU-PF’s political culture. Yet, Mugabe’s anti-imperialist rhetoric and socialist flag-waving did not put him in the group of regressive right-wing regimes. Indeed one of the ambiguities of the term, authoritarian populism, is the difficult match to the now outdated categories of left or right. With liberation movement parties still in power in southern Africa, a particular form is evident. Former president of South Africa, Jacob Zuma, had a well-honed populist streak, but maintained control by leveraging power in different ways through a ‘captured’ state. Julius Malema the firebrand Economic Freedom Fighters opposition leader is the supreme populist, with often extreme authoritarian tendencies. It’s not surprising given their histories that both in Zimbabwe and South Africa, land is central to the populist discourse – linking in turn to nationalist narratives and liberation struggle commitments. With debates about ‘expropriation without compensation’ this has risen to a higher gear in South Africa, and parallels (usually wildly inaccurate) with Zimbabwe are frequently made. Now with Zuma and Mugabe gone, what are we to make of Ramaphosa and Mnangagwa in this frame? Both have been spouting populist promises in their first months in power, but this is fairly standard political fare, and large pinches of salt are recommended. Both also appear to be committed to a business-friendly, open investment economic position. Both countries are ‘open for business;’ presumably including both leaders’ businesses, of which there are many. It is too early to see whether a new state project is being cultivated, and whether this could be described as ‘authoritarian populism’, as Zuma and Mugabe clearly were, although with very southern African flavours. Key will be to understand the nature of underlying power, and how accountable this is. Neither have faced national elections as yet, so we don’t yet know how popular the populist pleading will be. While South Africa’s democratic roots run deeper, the concerns validly expressed about the military influence in Zimbabwe are real. Much discussion of southern African politics – and perhaps especially Zimbabwean – is rather insular. However, the intersections of authoritarianism (in various forms) and populism (also with many dimensions) is a phenomenon across the world. Reflecting on other settings may help us understand how military muscle and populist promises mix and match in the Zimbabwe setting. It’s often not a pretty sight. Effective resistance and opposition mobilisation with new styles of emancipatory politics are needed to counter authoritarian populism globally, but currently in Zimbabwe this doesn’t look likely, as in its early days Nelson Chamisa’s MDC seems to be exhibiting some of the worst authoritarian populist traits, this time with an evangelical Christian religious tinge. As the election year in Zimbabwe unfolds, making sense of the new politics will require some new lenses, and different responses. Thinking about authoritarian populism and how to confront it across the world may help focus thinking in Zimbabwe, so do check out the many materials emerging from the ERPI. By announcing the intention to change the Constitution to allow for ‘expropriation without compensation’, the ANC has tried to steal the thunder of maverick radical Julius Malema and the Economic Freedom Fighters party. 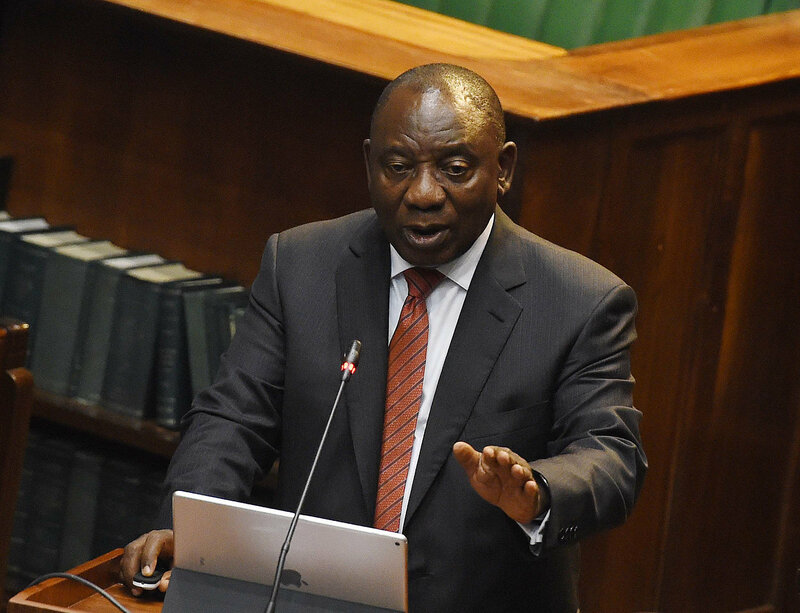 Last week a motion was approved in Parliament with the full backing of new president, Cyril Ramaphosa. There has been panic and outrage. The white privileged classes are shocked. Sections of the international media are apoplectic. Capital has warned of the worst. The rand has taken a knock on the markets. And the newspapers and airwaves are full of vivid commentary of impending doom. And – yes of course – Zimbabwe is once again being deployed in South Africa’s political discourse as the example of how bad it can become. This is just like Mugabe’s land grab, which can only result in poverty and disaster. And on, and on, with all the usual myths and stereotypes being trotted out. More sane commentary points out of course that this is more about political power plays than any big change. Listen to an excellent interview with Ruth Hall, and further commentary here and a useful round-up here. Unlike the EFF, which is calling for land nationalisation, the ANC has made no mention of such a move. To allay fears, they’ve announced that expropriation without compensation would only take place only if food security and the wider economy was not threatened. Quite how this would be assessed is anyone’s guess. The problem in the past has been that the ‘willing seller-willing buyer’ approach has been the policy default. This has meant a slow pace of change and high costs when ‘market prices’ are paid, as in the notorious R1 billion originally proposed payout in the Mala Mala case. Shifting the balance towards expropriation, away from only a reliance on the market may change the dynamic of land reform for the better. Debates must follow as to what just and equitable compensation would be. Sometimes it will be zero; in most cases not. One of the foci for outrage and panic has been the presumed assault on the unassailable ‘property rights clause’, a key element of the negotiated settlement of 1994. In South Africa, this is an ideological lynchpin; an almost religious conviction that the world would collapse if there was any change in freehold property rights. Again, as discussed many times on this blog before, these arguments are replete with myths; ones that keep being repeated in Zimbabwe. For example, see these recent pieces by John Robertson and Eddie Cross, offering textbook repetitions of the same problematic arguments seen in South Africa in the past weeks. Under the new proposals, a framework of property rights would continue to exist but the conditions would change, just as they have in Zimbabwe. A new post land reform framework can continue to be the basis for investment, finance and successful agriculture. Indeed, as it does in many other parts of the world without the weird hang-ups that are the legacy of southern Africa’s settler past. It is this past that is swirling around the debate in South Africa. Race, white privilege and the unresolved questions of redistribution following the end of apartheid are all central. As Ben Cousins points out, those who are suffering the most from expropriation without any hint of compensation are poor blacks in places like Kwazulu Natal, where chiefs, holding state land in trust in the communal areas, are complicit in massive expropriation for mining, housing and other grabs. This seems not to be part of the debate, as it’s framed as an assault on historic white privilege. Seen through this lens, the pleading of the (mostly) white farmer lobby or the business community is simply an argument for continuing special treatment that started with colonialism. The big mistake of their Zimbabwean equivalents from the 1980s, and particularly in the late 1990s, was the abject failure to accept that change was long overdue and then not engaging with the process fulsomely and positively, so shifting the narrative. With the Motlanthe High Level panel report out, a political debate raging and a new president, this should be the moment in South Africa to change the discourse on agriculture and land reform, after so many years in the doldrums. Unlike in the 1990s in Zimbabwe, this must mean everyone engaging in a national dialogue. One of the best contributions in the furore last week in South Africa was from Sue from Somerset West who called into Eusebius McKaiser’s talk show, proclaiming emotionally that not all whites are against land reform, and that grappling with white privilege is vital. A brave and powerful intervention. The lesson from Zimbabwe for South Africa is not that land reform is a disaster. Far from it – it is essential for economic renewal and central to moving on from the past. Agrarian reform in post-settler economies must deal not only with economic reconfiguration, but also fundamental changes in institutions and outlook for a new era. Hopefully this is the moment for South Africa – at last – to confront these tough transitional issues, now 24 years on. An excellent new book is out in South Africa, focusing on titling and tenure. A big issue for policy in Zimbabwe. It’s called Untitled. Securing land tenure in urban and rural South Africa, published by UKZN Press and edited by Donna Hornby, Rosalie Kingwill, Lauren Royston and Ben Cousins. It’s well worth a read. While based on South Africa, where the obsession with freehold title is an article of faith, it has many resonances for Zimbabwe, and beyond. We have just published a book which disputes this view. Untitled. 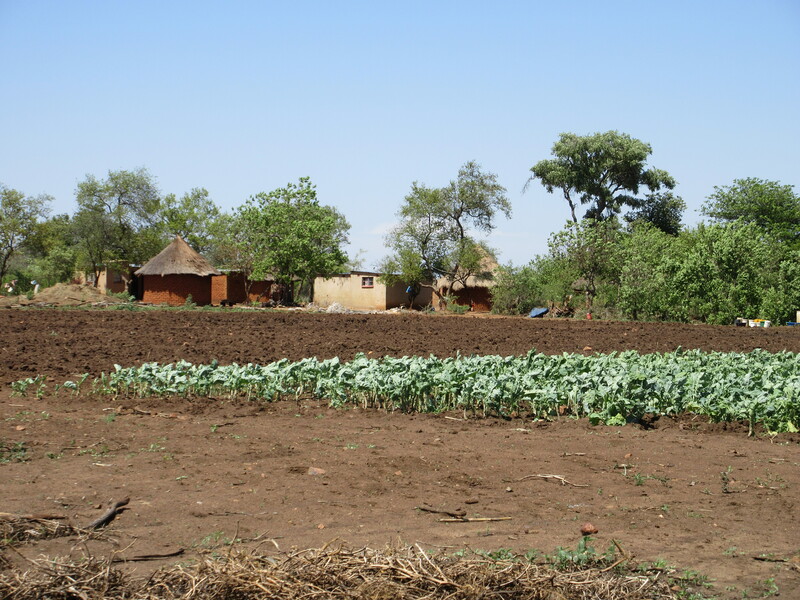 Securing land tenure in urban and rural South Africa contains case studies of a wide range of land tenure systems found in different parts of the country. These include informal settlements, inner city buildings in Johannesburg, “deep rural” communal systems, land reform projects, and examples of systems of freehold rights held by black South Africans since the 19th century. With the exception of systems of freehold rights, most people who occupy land or dwellings in these areas are “untitled”, and occupy land or dwellings under a very different kind of property regime. We term these social or off-register tenures. But we argue that, fundamentally, South Africans need to question the assumption that the sole solution to the problem of tenure insecurity is a system of title deeds. Alternative approaches are needed, which we set out to explore. The book offers an analysis of social tenures, which are regulated by a different logic and set of norms than those underpinning private property. Such tenures are diverse but share some key features. As is the case across the developing world, including Africa, land tenure is directly embedded in social identities and relations. Rights are often shared and overlapping in character and generally derive from accepted membership of a community or kinship group. Processes of land allocation and dispute resolution are overseen by local institutional structures. In these contexts, decisions are often informed by norms and values that stress the importance of reciprocal social relationships rather than buying power as the basis for land allocation. They involve flexible processes of asserting, negotiating and defending land rights, rather than the enforcement of legally defined rules. It’s estimated that in 2011 some 1.5 million people lived in low-cost dwellings provided to the poor by government’s, so-called “Reconstruction and Development Programme” (RDP) houses, with inaccurate or outdated titles, in most cases due to transfers outside of the formal system. Another 5 million lived in RDP houses where no titles had yet been issued due to systemic inefficiencies. Along with 1.9 million people in backyard shacks, 2 million on commercial farms, and 17 million in communal areas, this means that in that year around 30 million people, nearly 60% of all South Africans, lived on land or in dwellings held outside of the land titling system. The book contrasts social tenures with the conventional system of title deeds, which constitutes a key element of an imposing “edifice”. The current system of rates, services and processes of development assumes that land tenure equals a surveyed plot with a singular registered owner, which may be persons or corporate bodies. The system is serviced by a Deeds Registry, private sector surveyors and conveyancers, as well as municipal officials, all governed by a range of laws and regulations in a complex and interlocking manner. One key problem facing those in social tenures is the discrimination they suffer at the hands of the state and the private sector. Despite some protection under laws such as the Interim Protection of Informal Land Rights Act of 1996, people living in social tenures are severely disadvantaged. They may have to go to court to have their rights legally enforced, but most cannot afford to do so. Development and land use planning, public investment and service delivery are constrained under these systems of tenure. Elite capture or abuse by unaccountable leaders can also take place, as in communal areas where minerals are found and chiefs and councils enter into business deals with mining companies that benefit only a few. Titling enthusiasts argue that another problem with social tenures is the fact that banks do not accept untitled land or dwellings as security for bank loans. This constrains the poor from borrowing capital to invest in businesses of their own. But research indicates that few of the poor are willing to risk their homes in this way, since small enterprises often fail. How then to proceed with pro-poor tenure reform? Our research indicates that it is not realistic to extend land titling to all; the system may be at breaking point, and is inadequate even for the emerging middle class. Another option is to adapt elements of the edifice to provide a degree of official and legal recognition of rights within social tenures. Lawyers and planners working with communities and officials have developed a range of innovative practices, concepts and instruments aimed at securing such rights in an incremental manner. This includes special land use zones, recognising occupation rights in informal settlements, and recording rights using locally accepted forms of evidence. A third option is a more radical overhaul of land tenure, leading to systematic recognition of and large scale support for social tenures. This would involve stronger laws protecting rights holders, an adjudication system that allows new forms of evidence to be considered in determining who holds rights, and new institutions for negotiating, recording and registering rights under social tenures. The system could include the office of a Land Rights Protector. We believe that these alternatives all pose their own challenges. But we also believe that pursuing alternatives to a system of title deeds is not an impossible task. It has been a dramatic week in Zimbabwe. There has been a (not) coup, Robert Mugabe has been expelled from ZANU-PF, but so far has not stepped down from the presidency [he has now, resigning a few hours after this was posted]. No-one could have predicted this, and no-one can guess what will happen next. I will not try, but just offer some links to some other commentary. So what happened? The tanks rolled in, an officer in army fatigues made announcements on the TV, and the rumour mill on social media exploded. It certainly seemed like a coup. For those of us with links to Zimbabwe, we stayed up much of the night, had our attention diverted during meetings the next day, as we kept checking Twitter feeds and WhatsApp messages to make sense of the confusion. And then, all smiles, General Chiwenga, the head of the army, appears at State House with President Mugabe, and a delegation of South Africans, plus a Catholic priest for negotiations about the departure of the president and a transfer of power. Photos were taken and tea was had. And bizarrely, negotiations on-going, the next day the President shows up at a graduation ceremony in full academic regalia. It could not have been scripted. 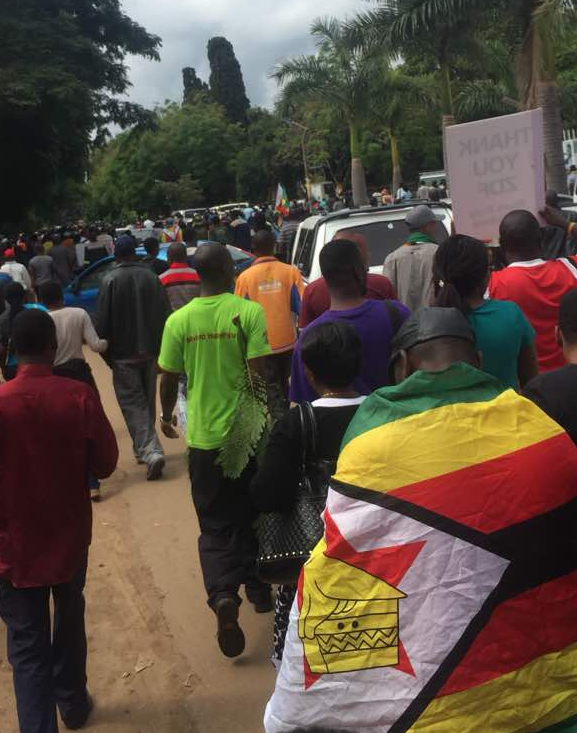 On Saturday, people of all races, creeds and political backgrounds, marched on the streets alongside the army, celebrating the possibility of change, and rejecting the meddling external intervention of SADC and the AU. The marches were a spectacular demonstration of peaceful, non-violent solidarity with the defence force’s intervention, although questions must be raised about what was being backed. And then on Sunday, ZANU-PF removed Robert Mugabe as head of ZANU-PF, replacing him with Emmerson Mnangagwa, recently dismissed as Vice President. Others in the G40 group, led by Mugabe’s wife, Grace, were also expelled, with threats of prosecutions to follow. Later on Sunday evening, after a long wait, it got even more bizarre. Everyone, possibly even the generals in attendance, thought this was the resignation of the president, but in a long and rambling speech and much shuffling of papers, it ended with thank-you and goodnight, polite applause and a stunned silence from the rest of the world. We must remember that this is no people’s revolution, but is all part of a long-running generational struggle over power within ZANU-PF, with Emmerson Mnangagwa’s Lacoste faction, backed by the army and firmly rooted in the older generation with liberation war credentials, ousting the younger G40 faction, with Grace Mugabe as its figurehead. That, as ever, the focus has been on Robert Mugabe himself may ultimately be missing the point. Many of the potential players in any new dispensation have long, often extremely murky, histories; are embedded in complex business networks and have deep security service connections. It’s a complex web woven over many decades, and it will not be easy to unravel, even under the veneer of constitutional transition. For the opposition groups in any prospective transitional authority [which of course didn’t materialise], the ZANU-PF network will be tough to influence, as they found to their cost during the Government of National Unity from 2009. What happens next remains very uncertain. Impeachment proceedings are starting, but these may not be as straightforward as some suggest. A resignation may yet happen [it did], but since this is officially not a coup, the army are playing by the constitutional rule-book. There are a lot of constitutional lawyers in Zimbabwe, from all sides, it seems. It has been an extraordinary, exhausting week. No panic, no violence, and (so far) all very civil. Very Zimbabwean. Blessing Musariri offered an amusing commentary on the mood. There was lots of humour in the Twitter commentary too. Suggestions that General Chiwenga and the Zimbabwe National Army might be deployed at the Emirates to deal with a long-standing succession question at the Arsenal. The #apolojersey meme that began circulating after ZANU-PF Youth League head Kudzanai Chipanga, wearing a jersey and showing poor fashion judgement, apologised on TV for criticising the army. Tweets suggested that all apologies forthwith should be done while wearing the jersey, and there were many photo-shopped suggestions of who should do so. And then there was the outline script of the Hollywood film was proposed, with American actors playing all the leading roles and unable to pronounce Mnangagwa and Zimbabwe. And of course the much shared comment that Zimbabwean coups are so much more peaceful than elections, and that they should be held every five years (retweeted approvingly all over Africa). This social media melee was the only way of getting information; things have been happening so fast. Thanks to @TrevorNcube in particular for keeping a lid on the speculation, and checking before informatively tweeting. Invaluable. In the UK, you are of course subject to the ill-informed mainstream media barrage on Zimbabwe. The narrative of decline is endlessly trotted out: the ‘basket case’ of Africa, a cabal of incompetent cronies at the helm, the ‘disaster’ of land reform, and on and on. Tedious, tiresome and very often inaccurate. But unlike on previous occasions when Zimbabwe has hit the global headlines, there are some really thoughtful Zimbabweans available for the TV and radio punditry. Alex Magaisa and Miles Tendi, coming from different angles, were great. It’s excellent to have Zimbabwean profs in our UK universities to give a sophisticated, nuanced take. Most journalists are just too lazy to get into the detail, but assume they know the story without asking the questions. A point made by the brilliant Petina Gappah in a perceptive tweet (@vascodagappah). One exception (and of course there are more) is @fergalkeane47 from the BBC who, thanks to his superb reporting from South Africa in the early 1990s, knows the southern African context, and vitally its history, well. All of these analyses are fast being superseded by events. We don’t yet know the configuration of any new political settlement. In the process, complex manoeuvres must show that this was all aligned with the constitution, and not a coup. Those likely to back any new regime – China, South Africa and the UK are key – all need to be convinced. Change in Zimbabwe has most definitely long been needed. Ironically, Mugabe’s undoing has been a result of perhaps his greatest legacy: a highly educated population – and elite political-military class – able to mobilise effectively, and in this case together. However, whatever happens in the next days and weeks, Zimbabwe’s problems have certainly not gone away, and these momentous events are only a beginning. Hopefully a longer-term, democratic transformation will occur, but it is far from assured. Just as with Zimbabwe’s Independence in 1980, issues of land, agriculture and rural livelihoods will be central. More commentary on this on Zimbabweland in the coming months. While sugar consumption is rising with increasing wealth and urbanisation, the prospects for export to the favoured European Union market look more fragile. In 2017 preferential trade access ceases, and with this the huge ‘adjustment’ payments that some southern African countries and sugar corporates have received as aid. Nevertheless the sugar giants, mostly centred on three South Africa-based companies – Illovo, Tongaat Hulett and TSB – as well as new entrants, are still eyeing up cheap land, good soils and water resources for new ventures. With these major changes underway it is a good moment to review the political economy of sugar in southern Africa. This is what a new open access special issue of the Journal of Southern African Studies does. There are 9 papers, with case studies from 7 countries across the region, and a valuable comparative overview of patterns of accumulation in different operations. The issue argues that the region’s sugar industry provides a useful lens through which to understand current dynamics of corporate capital and agricultural production in Africa. The papers highlight the rapid concentration of corporate control over the past decade, but also the very diverse outcomes across the cases. Capital does not operate in a uniform way, and local contexts, resistances and struggles, and wider political economy make a big difference. Taking the company Illovo (now owned by Associated British Foods), Alex Dubb shows how it gains high profits in Malawi due to favourable market conditions (notably preferential trade access and protected domestic markets) and high productivity (combining cheap field labour, land and water with capital-intensive milling). By contrast, Mozambican profits come exclusively from favourable market conditions, while profits in Tanzania, Swaziland and especially Zambia are due to particularly high levels of productivity. South Africa, Illovo’s country of origin, receives low profits, making expansion across the region essential for commercial success. Value relations, at the heart of political economy, are core to understanding accumulation through sugar, Dubb argues. As companies seek to expand their operations, the search for cheap land, water and labour continues. 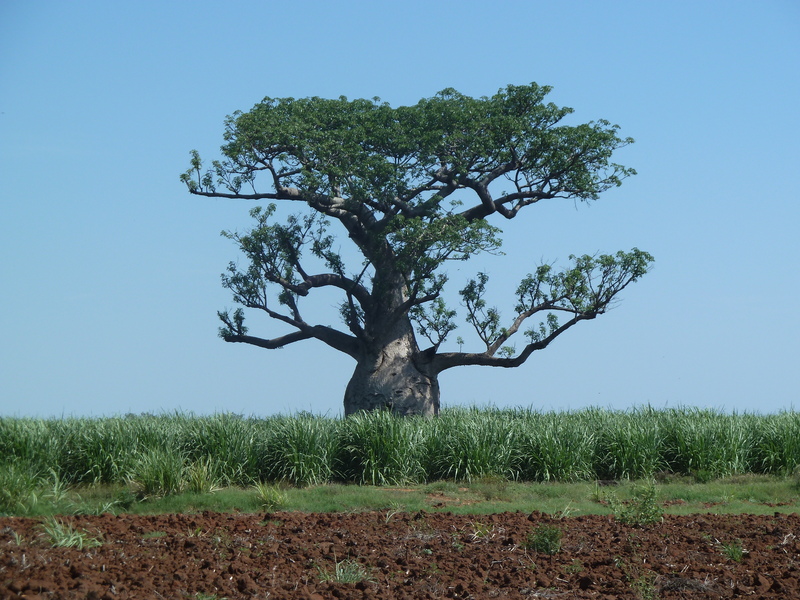 As papers from Malawi and Tanzania caution, attempts at expansion of sugar land through grand development schemes – such as the Green Belt in Malawi or SAGCOT in Tanzania – may result in elite capture and exclusions of poorer people, even when ‘outgrower’ approaches are advocated. A central theme of the papers is an examination of the diverse patterns of ‘outgrower’ sugar cane production. This is massively different in South Africa, Zambia, Zimbabwe or Swaziland for example, where starkly different relationships between the estate and mill and smallholder outgrowers (of different scales, and with different involvement in direct production) apply. While often presented as the ‘inclusive business’ solution to corporate engagement with smallholders, it is clear that there is no single model, and relations between corporate capital, states and local producers varies massively. How then should we understand sugar in southern Africa? Is the sugar industry part of a new developmental frontier in the region, transforming investment, market opportunities and livelihoods with a ‘win-win’ model, centred on linking core agro-industrial investments with outgrowers, as the industry and other advocates claim? Or is it a predatory form of capital, backed by elites and international finance, where production and market risks are transferred to vulnerable smallholders and estate labour; where land and water resources are ‘grabbed’; where a colonial model of exploitative estate production is at the centre, and profits are accumulated through monopoly power? The experience in southern Africa suggests that these stereotypes rarely apply. While the logic of capital results in a relentless pursuit of profit, state agency and national political-economic context influence outcomes, as do local conditions. Local negotiations, resistances, and accommodations matter. The result is diverse patterns of production and profit, together with different livelihood outcomes for very different types of ‘outgrower’, and quite different implications for different groups of estate labour, as shown for Xinavane in Mozambique, both in terms of gender relations and health and wellbeing. With the vagaries of the international market dominating, and the changing fortunes of large corporate agribusiness capital in the region so deeply intertwined with this, we cannot predict whether the long-established corporation-state-outgrower relationship will persist. But for now, in all its variety and differing political dimensions, this relationship dominates the southern African sugar sector, and is central to understanding its contemporary political economy. In 22 years land reform has barely altered the agrarian structure of South Africa, and has had only minor effects on rural livelihoods. 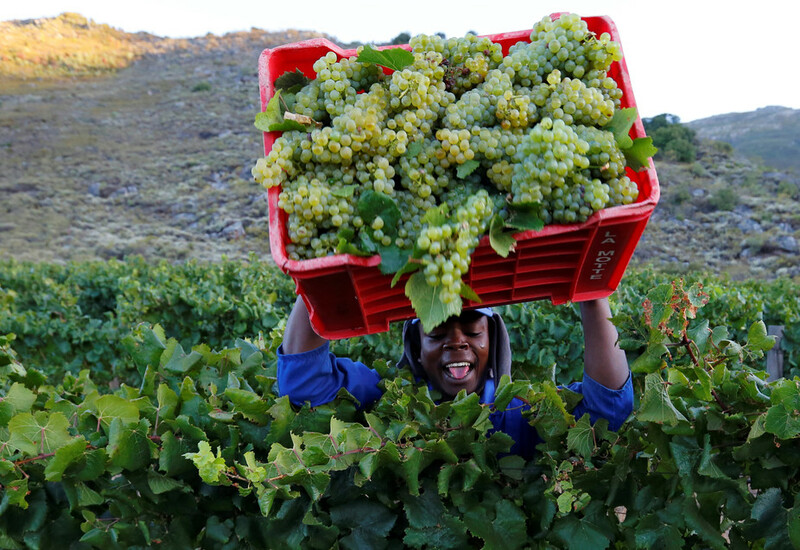 Since 1994, about eight million hectares of the total of 86 million hectares of white-owned farmland have been transferred to black South Africans through land restitution and redistribution. Government’s initial target in 1994 was to transfer 30% of agricultural land by 1999, but slow progress led to the target date being moved to 2014. Several thousand large rural restitution claims are yet to be resolved, and about 20,000 settled restitution claims have yet to be implemented. Amendments to the law in 2014 allow hundreds of thousands of new claims to be lodged up until 2019. Land reform needs to make a fresh start. Realistically, land and agrarian reform is unlikely to reduce the poverty of most rural people. The creation of formal-sector jobs and non-farm livelihood opportunities for the majority of the population should be at the centre of poverty reduction policies. And a re-invigorated programme of land reform could probably create a million new employment opportunities, as the National Development Plan suggests. A competitive and increasingly concentrated agricultural economy has shaken out a large number of white farmers. However, about 70%-80% of farms produce only 20%-30% of value, and many of these are under stress from the current drought. This land could be acquired for redistribution relatively cheaply. The top 20%-30% of producers, 7,000 highly capitalised farming operations on about 20 million-30 million hectares, could then be left alone for two decades or so. This will ensure that land and agrarian reform does not put urban food security and agricultural exports at risk. 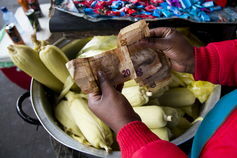 Municipalities should support informal markets where most of the produce by small black farmers is sold. Black smallholder farmers currently tend to supply informal traders and loose value chains that have less demanding requirements for fresh produce than those of supermarket chains and formal markets. Informal markets should be actively supported by municipalities. As their farms become more capitalised, some small-scale producers will improve the quality of their produce and begin to supply formal markets, and government could consider requiring supermarkets to meet quotas for smallholder produce. Political rhetoric on land draws on a narrative in which white farmers and foreigners are villains, black South Africans are victims, and government (or an opposition party, or civil society activists) are heroes riding to the rescue. A political imaginary centred on race tends to dominate land discourse. For many young activists today, “land” seems to connote the nation, sovereignty and control of the economy as a whole, rather than a resource used for food production. The dual meanings of “land” in English elide the difference, but in nationalist and populist discourses such elisions help to mobilise supporters. This article draws on a paper commissioned by the Nelson Mandela Foundation.